2536 years ago, on this sacred Indian soil (Bharat kshetra), universally most respected Bhagwan Mahavir preached the nature of the entire cosmos to beacon the path of liberation through his divine speech (Divya dhwani). After his nirvana, jain ascetics (Acharyas) composed several scriptures, maintaining the continuum of Bhagwan Shri Veer’s preachings. In the same convention there was a great saint named Acharya Kundkunddev during the first century of Vikram Samvat (1st Century BC). In the Digambar Jain tradition, his status is most imminent. 'Bestowed by five names - Padmanandi, Kundkund-acharya, Vakragriv-acharya, Ella-acharya and Gruddhapichchh-acharya, possessor of miraculous power of walking four fingers above the ground in space, one who had paid homage to Bhagwan Simandhar in eastern Videh and through the scriptural knowledge gained from him, has addressed the liberation seeking souls of India (Bharatvarsh)...."
In Acharya Kundkunddev’s linage, amongst many enlightened souls (Gyanis), one in the recent time was Shrimad Rajchandraji. He taught spirituality to the common people and established an institute- ‘Param Shrut Prabhavak Mandal’, to propagate religious philosophy. This way the people of Gujarat-Kathiawar will remain indebted to him forever. In the present era, to the great fortune of spiritual aspirants of this region, the supreme benevolent, epoch-maker Gurudevshee Kanjiswami took birth in Umrala-a small village in Saurashtra, in the year V.S. 1946 (1890 AD). Pujya Gurudevshree’s conscience was searching for eternal truth right from his childhood and as the destiny would have it, in the year V. S. 1978 (1912 AD) the ultimate scripture on spiritual science Acharya Kundkund dev’s ‘Samaysaar’ came in his holy hands. Like an accomplished jeweller, he identified this composition of spiritual wealth as the most precious jewel. With benignity of Samaysaar, he sighted his inner self. This also transformed his pious soul. The lost disposition found its own destiny and the stream of applied knowledge found its direction. Jineshwar Sunandan Gurudev’s knowledge buds blossomed like never before. As Gurudev made in-depth study of ‘Samaysaar’, he experienced profound spiritual wisdom of Acharya Kundkund, which was inherited by the Acharya from Omniscient Lord & he saw that the essence of their preachings was retained very carefully. Gurudevshree pondered over ‘Samaysaar’ for many years. His benevolence towards the truth seekers led him to think- ‘All worldly souls should understand the value of this invaluable treasure gifted by the Omniscient Lords and end their misery from the time memorable”. As a result of this kind thought, Gurudevshree started giving sermons on Samaysaar. Thereafter for 45 years, he settled at Songadh - a delightful village in Saurashta and gave insightful lectures on various shastras such as Panchasikay-Sangrah, Pravachansaar, Niyamsaar, Ashtapahud, Ishtopadesh, Samadhi-Shatak, Bruhad-Dravya-Sangrah, Purusharth-Siddhi-Upay etc. With a purpose that the inquisitive Jains and Non-Jains can take benefit of Eternal Digambar Jain religion propounded by benign Gurudevshri, Late Shri Navnitbhai C. Zaveri, President, Shri Digamber Jain Swadhyay Mandir Trust -Songadh initiated a project for dissemination of Tape-recorded lectures at his own expense. He used to send an instructor with the tape machine to various places in the country. The divine speech of Gurudevshree is preserved even today and both, old and the new generation is incessantly feels gratified. Shri KundKund-Kahan Parmarthirk Trust, inspired by Shri Shantilal Ratilal Shah family has taken forward the outstanding project of tape-recording propagation initiated by respected Shri Navneetbhai. The trust has successfully converted almost 9000 available lectures (each for a period of 1 hour) of Pujya Gurudevshri in DVD and Blue Ray Disc. All these lectures are now available on the website www.vitragvani.com. Additionally, the trust is publishing Gurudevshri’s lectures verbatim in books form. These books can be downloaded in Gujarati & Hindi language in .pdf format from the website. 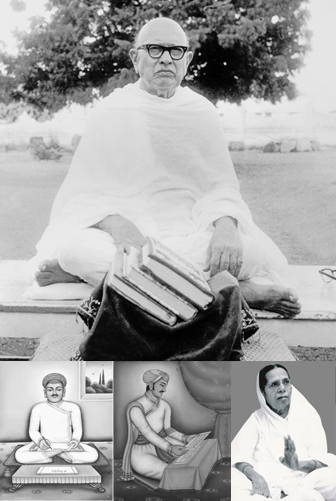 As Shri JaysenAcharya quotes: "Whomsoever, with great devotion will study, listen, learn & spread these scriptures composed by self-realised, enlightened persons, than he will experience everlasting, true, inherent nature of soul; thereby will achieve the ultimate status and will be engrossed in liberated & blissful state till infinity." - This also is the sole aim of our website and the trust too. Inspired by Shri Shantilal Ratilal Shah Family.